A most satisfactory end to our summer programme of opening on Wednesdays. The service was in the able hands of John A, Chris B and Elliot supported by Rodney at Duffield, Leigh at Wirksworth and Angela and Izzie in Catering. Patrick and David A ran the Ravenstor service to take some of the pressure off the Duffield crew. It remains quite a long day and my thanks go to everyone concerned. John Evans shepherded the "Autumn Club" who had a delightful day enhanced by repeated visits to the Buffet Car for Angela's bacon butties - a PR success! The Head of Gardening returned to the Wirksworth station garden but requested a week's leave to see where the Scots were kept at bay. If they keep up the pressure hopefully the Scots will complete the Edinburgh light rail system before being allowed down south again. Gary accurately positioned yesterday's photo as the Royal Victoria Railway at Netley on the Solent but there is no financial prize I'm afraid! - but he has my good wishes. The PWT concentrated on Wirksworth Yard as they started to make essential repairs to the "single slip" which is showing signs of its great age. This work will continue tomorrow. Mick and David N visited Bownes of Worksop to source more fishplates and bolts for the Idridgehay to Shottle project. The DST had the services of a crane to lift Henry Ellison's boiler into a place where it can be retubed and returned the tanks and cab to Cathryn after exploratory work to determine its suitability for restoration. The Paint Store was finally bottomed yielding a quantity of scrap for our skip and enabling a knowledge of what we actually have in stock. The BSK received further attention in the quest to make it usable. A pleasant day with many happy passengers. My thanks to all who made the Bank Holiday Weekend work in fairly poor weather conditions representative of the archetypal British summer. Today saw a return to extensive endeavour in many areas with the PWT heading south to gather materials for the planned improvements to the Wirksworth Yard infrastructure. (The team leader will be present tomorrow to advise and guide on the works to be achieved.) The VCT concentrated on defoliating bridge DJW24, Derby Road 1, reporting one large fire to dispose of the brash. This work is most useful in providing the background to enable Network Rail to continue their assistance with bridge surveys and examinations. The DST worked on all three of our resident steam engines. No3 was cleaned out after its use last Saturday and Henry Ellison had continued attention to the plates that will receive its north end buffers. Sand pipes and the clack valves received attention. Cathryn featured with the underframe receiving work and the tanks having paint applied together with the now exposed boiler. Our lone carriage cleaner was accompanied by son and heir dealing with the daunting task of the trailer car used by the steam loco together with our three car Met-Cam set. Dorothy set off with the discoloured antimacassars from the trailer car - do some people not wash their hair? The flail was in action at Hazelwood and down the straight towards Duffield. On return to Wirksworth a hedge trim at Ken Rowlands crossing should embarrass him to complete the rest of his estate. The LMSCA has been researching the fitting of steam heating to the Third Open rejoicing in the discovery of a new recruit who is an enthusiast for this sort of work. They also test drove a new window blind with quite some success. There was a sort out of the paint store and discovery of many tins containing amazing colours. The Booking Hall dealt with the residual financial effects of the Bank Holiday Weekend and commenced preparation for the next influx of passengers. A modest start to the Bank Holiday Weekend which saw a day of mostly sunny spells and a few showers, but of note was how cool it was! Most of the energy today was directed into running the passenger service but the LMSCA were working away down the yard, as were the 8F group. The Class 33 received even more paint from the group that look after it and many photographs of the locomotive were taken of it on show in Platform 1. A wet, dank, miserable day which tested everyone's resolve but we shone through! Our Drive a Diesel Day clients were capably hosted by John Allsop and David Abbott, on work experience from the Bluebell Railway. They expressed their pleasure in the days activities with the furthest travelled coming to see us from Aberdeen. During the afternoon journey to Duffield they encountered further tree felling on the "racing straight" by our neighbour there resulting in the line being fouled by branches. Words have been exchanged with the person concerned and no further activity is promised. Nonetheless the team had to return to the area to ensure the line was clear for tomorrow. The lunch for our Drive a Diesel guests was provided by Dorothy assisted by David and I thank them for this. One of the clients had his day as a birthday surprise only learning of his day as the car drove into our car park. Dorothy provided a chocolate birthday cake that made the day for his wife and children. I think they will be friends for life! Four potential steam drivers have been undergoing a test day with our independent assessor with mixed results. My thanks to JHT and Matt for providing the firing backup for these tests. The dmu team dealt with emerging problems with the corridor connection at the north end of the centre car together with refurbishment of the "doughnut rings" that surround the lights on 51505. The Booking Hall received substantial delivery of commodities that one hopes will be necessary for the upcoming Bank Holiday weekend. Unfortunately, as a result of today's activities, there will be no steam on the Incline Sunday and Monday. My thanks go to everyone who braved the weather today. The PWT researched materials at Wirksworth and Shottle that will provide the necessary resources to renovate the single slip pointwork in Wirksworth Yard that is becoming increasingly decrepit. This project is planned to commence the week after next and will require quite a lot of effort to ensure our normal services are not disturbed. The VCT managed to undertake work over the whole line with brash gathered from Duffield for burning, a continuation of vegetation clearance around bridges that require structural examination and a clear up at Jebbs Lane and Barnsley Lane. Their Landrover then returned to Wirksworth which will be the start place of next week's activities. Mike Billings worked through the day to effect flail repairs and further strengthening of the apparatus ready for further action next week. A special mention for Matt who has painted Cathryn's boiler to prevent it rusting after its attention by the boiler inspector and then went on to light a fire in No 3 ready for its role tomorrow. The water tankers were also filled ready for the Bank Holiday weekend. I failed to mention yesterday that our computer boffins had restored life to the tills in the Booking Hall and Buffet Car together with my internet connection. My thanks go to them for what is now a vital part of our business. The Booking Hall continued its vital role in income generation and upcoming events are now loaded to the web site. PS - a note from our supporter and Wirksworth's fire chief should bring a warm glow. His brother in law and wife were staying with them in Wirksworth whilst on holiday from Vancouver. They departed yesterday on the 1220 Wirksworth to Duffield service to travel via Derby, St Pancras and Paris to Spain. As Karl says "Who would have thought it possible not so long ago?" - wonderful! A key task has been performed by the PWT as they divided into teams and gave the whole line a track patrol discovering no alarms. John HT and Hylton took the Shottle to Duffield section where yesterday's heifer was still in residence near Postern Lodge. It is felt that she took a peculiar interest in our team following them for some way. Having taken her number the local farmer was advised that his substantial investment seems to like railwaymen. Our penultimate Wednesday service day had very good results with takings at Duffield and Wirksworth being most satisfactory. Many thanks to Vince S, Patrick and Chris B for running the train service, Rodney and Leigh for manning the tills and Angela for creating many complimentary comments about our catering. There was much shunting to put the logs and redundant sleepers into the car park for collection, moving the water tanks for refilling and the Class 33 to Platform 1 for display. A new water heater was fitted to the Gents toilet and the store room in the Training Room block now has a working light. All tasks going on in the background that makes life more bearable. The Passenger Manager tackled the graffiti that had despoiled the view at Hazelwood and Yvonne has tackled the vegetation invading the childrens play area. The last task uncovered a wasps nest that has been treated with a special concoction to encourage them to move on. Another most satisfactory and sunny day. Angela Dunn, our new catering supremo and bookkeeper - the ultimate cooking the books? - is very keen to hear from volunteer caterers who may have been turned off by the previous regime. Now down to the events of the day. The VCT tended to fence repairs at Postern Lodge, removed more hawthorn and had one large fire. They also had an encounter with an aggressive heifer and shamelessly retreated into their Landrover. A Network Rail contractor has spent a lot of today searching for a culvert that defeated us in trying to establish its exact position. After further and better particulars in think the location is narrowing down. The PWT dealt with wagons loaded with permanent way materials and discharged them at Wirksworth after their previous location at Shottle was determined to be unsafe. The boiler transport bogies were transferred from Wirksworth to Shottle for storage and the empty wagons berthed there. The team loaded the flatrol and lowmac with logs and brought them back to Wirksworth with some garden quality sleepers for sale. They had a very long and productive day. The dmu team researched some problems with the vacuum brakes on the three car set and hopefully resolved the problems. The doors on 50599 were attended to with satisfactory results. The computer boffins spent time trying to resolve the communication problems between the Buffet Car till and the server but, as seem inevitable, the problem worsened and all communication with the server is now down! More boffins are arriving tomorrow to try and resolve the problem which may be damage to the fibre optic cable. More news tomorrow. The LMSCA have been preparing material for their attendance at the National Railway Museum LMS weekend in York. The weed treatment team were in action yesterday and returned to the main problem areas. Richard P continued to hand treat areas around the Wirksworth station area. The DST had an anxious time with the boiler inspector who decided that certain work on Henry Ellison would need to be redone. However, he gave the all clear for work to continue to complete the locomotive. The team achieved further work on the vacuum pipe assembly, fire hole doors and the new plates to fix the buffers. There has been a whirlwind of activity to clean our service train, the Gatwick Express, the food preparation area in the Training Room and the toilet block. I can only express my sincere thanks for this work that relies on some really dedicated volunteers. The Filing Fairy has also had a brisk day of demands on her expertise and time. the next Induction at 14.00 on the 24th of September. 3 fence. In addition, the platform 1 running in board was repaired. the Wirksworth National Bank shortly with any small change. Another day with solid passenger numbers, including a party that were celebrating three birthdays in one party! The Gatwick Express TSO was decorated with balloons and bunting and a cake was provided much to the enjoyment of all. Elsewhere work continued on the LMS brake van and LMS coach. The 8F group were in attendance too. Some light maintenance was undertaken on the Class 33 which mostly involved some paint. A first aid course was delivered this morning followed by a fire safety session afterwards. It doesn't sound like much but must of the effort it put into successfully running train services! Another lively day with the Head of Gardening dealing with dead buddleia and lamenting the use of the station garden as a dogs toilet. On a more pleasant note we entrained four guests for a Drive a Diesel Day and four participants through the day on Steam Experiences. John A and Richard B looked after the diesel folk and Mick T and Hylton catered for the steam people. Every one seemed to enjoyed their day with us and were effusive in their praise for the instructors. In our transition period for catering Dorothy and David provided service for the diesel team and also picked up some passing trade to our benefit. I do thank them for going that extra mile whilst the new catering arrangements bed in. Anton was again involved in ensuring that we had supplies for today's requirements and enough for the weekend. At close of play the tills in the Booking Hall and Buffet Car work normally thanks to the ministrations of Richard Daldorf and I hope we have brought dramas in this area to a conclusion. During the day the water tank wagons were topped up despite some failures of the equipment to do this. At Duffield there was some activity to clear and bag brash for disposal. A strange happening occurred on Platforms 2 and 3 where a platform trolley was wrapped in bungee cords, photographed and unwrapped again. I think Tracey Emin was involved or may be Damien Hirst? Another most productive day for our enterprise. Another most satisfactory day with a large party from Holbrook chartering a train to Duffield and then enjoying a sandwich platter on the Gatwick Express followed by journey to and from Ravenstor. The catering team opened up the Buffet for the day and picked up sales from visitors in addition to the party. We were also able to sell a few seats on the charter to the passing trade. I am most grateful to John S, Chris B and Matt for manning the trains and Dan and Natalie for ensuring the catering was to a high standard. I am also grateful to Leigh and Chris Ralls for finally resolving the fault between the Buffet Car and server that has allowed the Buffet Car till to work without problems today. Background work has been achieved on the dmu fleet with a number of servicing jobs ticked off. Ferrybridge No3 has been prepared for tomorrow's customer which also involved shunting to refill the water tanks with Hylton rising to the day's needs. The tanks, dome and cab of Cathryn have now been sand blasted with Matt commencing the necessary application of undercoat before rust sets in again. The VCT concentrated on an area around bridge 4A together with tackling growth at Postern Lodge accommodation crossing. Some surprises in the requirements for Saturday's catering were dealt with and attempts were made to restore the fortunes of the Talking Tunnel. Not an unpleasant day which remained dry and pleasant in spite of dire weather forecasts. Reports have been received that the Railway Inn at Shottle has been refurbished containing a strong theme based on their proximity to our Railway. Research is needed! The Booking Hall had quite a busy and productive day. Quite a bumper bundle today as I had left my notes on the desk for yesterday's activities and there are a few more that need a mention together with today's doings. Yesterday Mike Billings commenced repairs to the flail head that requires constant attention given the heavy work it undertakes. A niggling IT fault that affects the Buffet Car till was identified and the necessary replacement part ordered with a view to repairs being concluded tomorrow. Richard P spent a very long day with a hand held weed treatment device dealing with many areas around Wirksworth station that really need attention. There was an incredible amount of shunting to put the Saloon back undercover and the centre car back in the dmu set for today. Today's services were operated by Graham, Tom and Jack to great effect on what is a long and tiring day. It was good to see Fred Morton also keeping his hand in after a series of chemo therapy treatments. The PWT achieved great things with the "mainline" restored to use after the removal of the redundant catch point at Wash Green. The end product looks very tidy and the last train of the day was able to return to its booked Platform 2. The Booking Hall welcomed our visitors of the day and the EVRA shop enjoyed the services of Tony Chave and Vince Ware to provide the necessary opening hours. The new catering regime got into its stride and I suggest you all try the quite delightful bacon butties. A team attacked Ravenstor to very good effect and repainted the gate, fence, benches and running in board. They also cleared and burned a substantial amount of brash from above the Platform and along the path to the Stone Centre. To complete the work the entire station and path have been weed treated. A most satisfactory job in keeping our estate tidy and presentable. During the afternoon I was able to promote mytesttrack to the world! 27 participants in the 22nd International Symposium on the dynamics of vehicles on roads and rails arrived by coach from Salford and had an induction into the work of MTT. By the world I mean that the visitors were from Japan, Holland, Spain, Latvia, Italy, Sweden, Denmark, Russia, France and the UK. Wirksworth is firmly getting on the map! A new version of the stock list is available for download from the Enthusiasts section of the website. The most notable change is the addition of the newly-arrived Class 33. A most productive day with over 50 volunteers participating in a range of activities. We entertained a charter from the Belper Stroke Club which included a number of people with disabilities who were most ably hosted by John Stokes, John Tedstone and Chris Beale for a round trip to Duffield followed by lunch on board the Gatwick Express. The team aided the less able to and from lunch and the catering team were rewarded for their efforts and attention. The PWT swung into action to remove the redundant pointwork under Wash Green bridge and made great strides into this project. The VCT worked around today's charter train to achieve a four fire day, one at Shottle and three in the Hazelwood area. The line between Idridgehay and Shottle was cleared of overhanging branches and the whole team of eight were productively occupied throughout the day. The DST seemed to be energised in four areas; scaffolding and associated equipment was shipped in to extend the present steam shed, the tanks and dome were lifted from Cathryn to be sand blasted, No3 received remedial work so that it is ready for Friday's steam experience day and Henry Ellison had attention to sand and vacuum pipes together with sundry other areas. There have been changes to our approach to catering following Jeff's illness and our Book Keeper, Angela Dunn, will now be in the lead until the end of the season. I would request that you all give Angela every support having very much been thrown in at the deep end. There was also activity in the LMSCA workshop and on the Mark 1 BSK. The Booking Hall was productive with further sales, analysis of selling prices in the light of costs and providing support to the new catering arrangements. It was good to welcome back Fred and Iris who gave the Mess Hall a very necessary thorough clean. The filing fairy was present again! A pleasantly warm and sunny day welcomed our Group Drive a Diesel Day participants. A variety of shunting manoeuvres were performed with L J Breeze. The combination of the Bubble Car and Iris was shunted and fuelled ready for the afternoon part of their day. The Group were very ably hosted by John A and Richard B and I am grateful to Anton for stepping into the breech to provide the necessary lunches. Tony W and Richard P set off in the Multicar this morning to apply further weed treatment between Wirksworth and Shottle. Upon their return further efforts were made to deal with the lawn north of Cemetery Lane bridge. The Booking Hall had quite a lively day meeting and greeting yielding a few pounds for the cause. PS I add my thanks to Chris Beale and the 31 team who ensured the locomotive ran successfully over the weekend. Quite an achievement given its long period of inactivity. There is also grateful thanks to Steve P, Dan and Angela who bravely stepped up to the line to ensure we had full catering on both days of the Gala. visitors staying all day to sample it. about us: especially those who made camp in the Saloon for most of the day. I leave you now to apply embrocation to several feet. A long but rewarding day which saw 4 Duffield services operated sucessfully by 31414, all of which were virtually full. More of the same tomorrow please! Work continued on the LMS Brake Van and LMS Brake Third. Final day of child with a splendid meal of fish fingers, ketchup and carrots which is very good for me I am told. Back at base we had a significant day with trials and testing of the Class 31 accomplishing two round trips to Duffield. All seems well and all trains this weekend from Wirksworth to Duffield will be worked by this engine and its backup team. Mick and Bob Grange entertained our four steam experience guests to great effect with many pleasant comments. Richard B was in evidence as we were inundated by interested visitors and he absorbed the role of tour guide all day. The welcome at any heritage railway is the most remembered part of the visit and Richard certainly make people glow with appreciation that does immense credit to our organisation. Behind the scenes we were trying to plug the gap left by the illness of our catering manager and some interesting solutions have emerged. All I can do is to suggest that if you visit over the next few days you say hello to the people that have stepped into the breach. The culmination of the day was the arrival late in the day of 33035 moved some 5 days after the planned event by Moveright International and we welcome 33035 owners and support crew to Wirksworth and hope we have a long and successful relationship with them. The Booking Hall had a tiring day with our guests and the catering situation to resolve and I thank Anton for dealing with all this in a calm and efficient way. I know some of you will still be thinking about summer holidays in August, but our Santa Specials 2011 information is now available. Tickets can be purchased online this year too! A much calmer day today than of late which saw the P-Way and VCT teams continue their quests down the line. At base, the LMSCA manufactured a new step board for the SK to quote "allow for safe boarding of passengers" this weekend during the Home Fleet Event. Work also continued to install a light into the vestibule on the Third Open. The Booking Hall got to grips with the odds and ends of Santa ready to sell tickets very shortly. First of all an apology for retransmitting to the e Group a message sent from Paul Rayner to me and I can only explain that we, domestically, are looking after a seven year old girl this week which is testing all our stamina. We feel like exhausted grandparents and whilst I relaxed(!) at the Railway today my wife and the child went to Twycross Zoo only to be locked into their gift shop because a chimpanzee had escaped! Another marketing opportunity for us as it is often said that there are a lot of animals at the Railway. Back to business, the train service ran well today thanks to the efforts of Chris, Mike and Mike together with Matthew. It was a legal service manned by a retired Judge and a retired Crown Prosecutor so no riots here then. The Model Railway and EVRA shop were open for the benefit of our visitors which were somewhat depleted by the unseasonal weather but we did welcome Barry Doe, the Fare Dealer, who had left Bournemouth at 0530 to be with us. The Duffield team were in place to welcome visitors there. There was something of a Catering emergency with the non appearance of Jeff and I am extremely grateful to Anton for stepping into the breach. We subsequently learnt that Jeff had been taken into hospital with a suspected heart attack and we wish him well. The Head of Gardening was in evidence and a two man PWT greased all the slide chairs in Wirksworth Yard before tightening the fishplate bolts on the Duffield loop that should see some service this coming weekend. A pleasant surprise was the scrap skip at Wirksworth had been recently cashed in raising a record £175. Not at all bad for all the "light" scrap loaded into it. Another empty skip awaits your, metal, contributions. A busy summers day with the P-Way team again down in the Shottle area. Back at base, the DST readied Ferrybridge No.3 for it's role at the Home Fleet Gala this weekend. The LMSCA worked to seal the guttering on the TO to prevent water ingress and the coaches were marshalled ready for the weekend. Passenger Services department were attempting to finalise the plans for the weekend as well in light of recent developments. A day of sunshine and showers with two main areas of activity. Tony W and Richard P set off this morning with the Multicar in a further attempt to do battle with the weeds that cover much of the main line. There is evidence that the war is being won and the team concentrated on where the line was particularly green. On return to permit the next activity to commence they hand weeded a good proportion of the lines beyond Cemetery Lane bridge reflecting great credit on their dedication. The other part of the day was devoted to a Group Drive a Diesel Day very ably hosted by John A and Richard B. During the morning opportunity was taken to put our rake of locomotive hauled stock together and berth them at Platform 1 involving a great deal of shunting to the pleasure of our guests. After lunch the Group had a whole line experience in the 3 Car set and parted with glowing praise for their hosts. The Booking Hall welcomed the Group and dealt with a variety of visitors and phone calls. The planned arrival of our Class 33, 33035, has been deferred to Wednesday due to a faulty trailer. Another sunny day in Wirksworth until right at the death which saw good passenger numbers and some interesting classic vehicles, including Del Boys van! The DMU team completed the installation of ceiling panels in 51505 for now and further fettling of the 31 was done ready for next weekends gala. Work progressed on the LMS Brake Van and on one of the boxvans. Firstly a word about yesterday as there was not a report. The day saw only a handful of volunteers on site with the main thrust being from the DMU team. They had changed a leaking coolant hose on Iris before the sparrows had risen and then proceeded to hang and connect up the new engine for 51188. The day ended with a successful run up. A track patrol was done by the P-Way team. Now to today. The passenger service bobbled up and down happily in the sunshine and there was a gathering of classic vehicles in the car park as an added attraction for visitors. Half of the DMU team completed an exam on 51188 after the engine change and then it was returned to the other 2 Met-Camm vehicles on the service at long last, whilst the other half proceeded to begin the installation of the new ceiling in 51505. The 8F group were working on Henry Ellison and the air seemed slightly blue around the LMSCA although apparently it was down to some self-assembly shelving units. A rather wet and cool day replaced the heat wave of the last few days. This made conditions a little easier for the PWT although the rain was unwelcome. A further 240ft section has been transposed between Idridgehay and Shottle leaving a similar length to be dealt with next week which will then have eliminated the side cut rail. The VCT worked steadily on the Up (east) side of the line north of Shottle removing one tree where branches were overhanging the line and creating one big fire. Mike Billings firstly moved a rail for the PWT and then settled down to flailing an area to ease the VCT's clearance work and then progressed south of Shottle. The LMSCA were on a quest to source wood for the BSK restoration and the Booking Hall continued its revenue generation work. Our second Wednesday of passenger operations produced satisfactory results again on a hot, humid, day that tested the resolution of all involved. My thanks go to the train crew of Tom, John and Richard who had little time for rest and recuperation, the Booking Halls at Wirksworth and Duffield together with the EVRA Shop and Model Railway. I am not sure what happened to the narrow gauge staff promised for today! The PWT fielded their track patrol teams and reported that all fishplate bolts were tightened between MP 136 3/4 and MP 135 1/2 and many between Idridgehay and Wirksworth where rails had been changed. There was an alert for potential rail buckling after the series of hot days and warm nights but no problems were encountered. Improvements were made to the Wirksworth Station area security and the hand rails on the Works Train brakevan received attention. A starter motor was fitted to the replacement engine for 51505 and the viewing area on the footpath to north end at Wirksworth was sealed off after repeated littering and petty damage. A very pleasant surprise was the presentation of a Duffield to Wirksworth token from the Electric Token Block instrument that resided on Duffield Platform until mysteriously disappearing before we came on the scene. 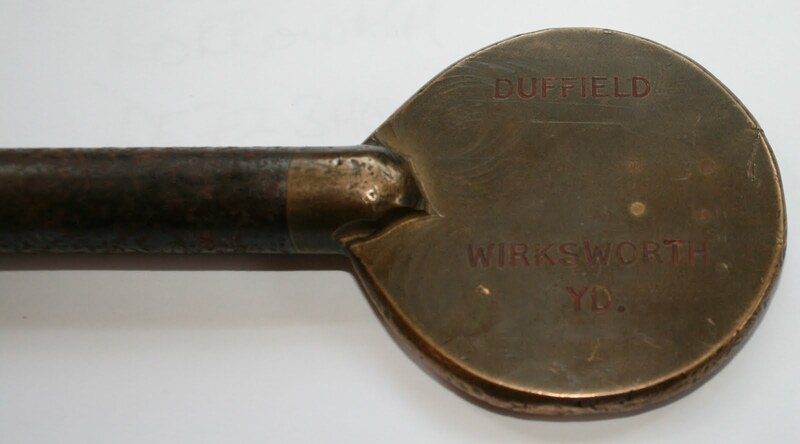 The donor operated the last rail vehicle to access the branch, a tamper, and knowing that the line would now be mothballed took the token released home. This may help to explain a slightly surreal discussion before we were granted permission to start clearing the line. It was said that we could not be granted access because the token had been withdrawn and it was not know where it had gone. Therefore we were not protected whilst working on the line despite the fact that nature had taken over and over a mile of track had been removed! A certain relative of Bob Gibbens resolved matters for us! Another Tuesday full of different activities that are the envy of other similar organisations. The PWT started to prepare the redundant Wash Green catch point for replacement by plain line and began to assess the crossing timbers we have in stock for remedial work in Wirksworth Yard. LJB's ignition is now properly key controlled and the horns activitated by button pushes that will add to security and ease of operation. The VCT reported a three big fire day and clearance of a further 60 yards of vegetation in the area west of the fishing club site north of Hazelwood. Milepost 140 3/4 has had its final coat of paint. 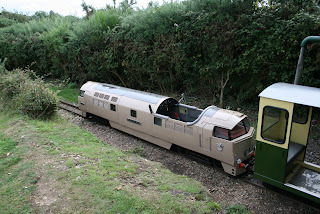 The DST has concentrated on No3 to check that servicing work was satisfactory and provide a firing test involving the coach and Incline trailer car visiting Idridgehay. Space has been released for the boiler of Cathryn to be put to ground and 51505 has been cured of a roof leak. The LMSCA has continued its great table project and one of our fitted vans received more attractive paint. The plants were watered both at Duffield and Wirksworth and weed treatment of Wirksworth yard followed on from yesterday's whole line tour by the Multicar in the relentless attack on the greening up of the "main" line. We were very pleased to welcome a group from Belper Womens Institute lead by Joan Blower, the widow of the late lamented Colin. They enjoyed their time with us and managed to produce another Craft related to our own Mike Craft. Reunited after their last meeting some 50 years ago travelling all the way from Belper - a close family! Our lone carriage cleaner tackled both Iris and the Bubble Car as well as dealing with debris in the Gatwick Express together with emptying the platform bins. All done in a pleasant manner and alone despite all efforts to join her with a companion or two. I am very happy that the filing fairy returned to very good effect and the Booking Hall welcomed our charter visitors and continued the revenue generation work. The plot for the upcoming Home Fleet Gala was finalised. As you may imagine, our enterprise was populated by many people to make all this activity happen and my thanks go to all of them.